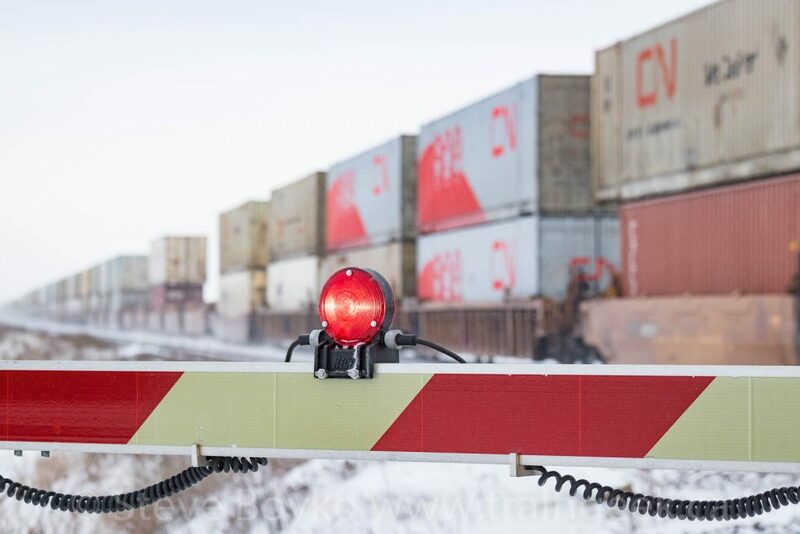 You may recall that I went out on a mission to find the new rail inspection portal at Nattress, west of Winnipeg. You might also recall that I didn’t find it. Well, I did some research, and consulted a few people, and determined exactly where it was. Consulting Google satellite views, I wasn’t sure that I could get right up to it but I could get close. On a cold December 29 morning, I set off before sunrise to find it. I started out along the CN Rivers subdivision. As usual, there were a series of eastbound CN trains waiting to come into the city. CN is very busy these days! The first of three trains was just past Hall Road (around mile 11). I was too lazy to get out of my car, so I just pulled off to the side and photographed it there. See above. I should mention that it was pretty cold out. At this time my car was saying it was -17C outside. The Environment Canada web site says the air temperature in Winnipeg was -18C at 9 AM with a wind chill of -29C. That’s brisk. 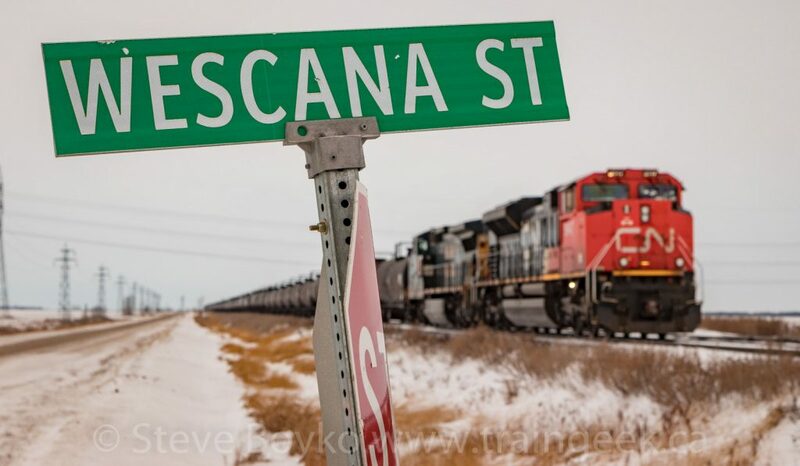 The next train was an oil train at Wescana Street, around mile 15, west of the CN-CP diamond. 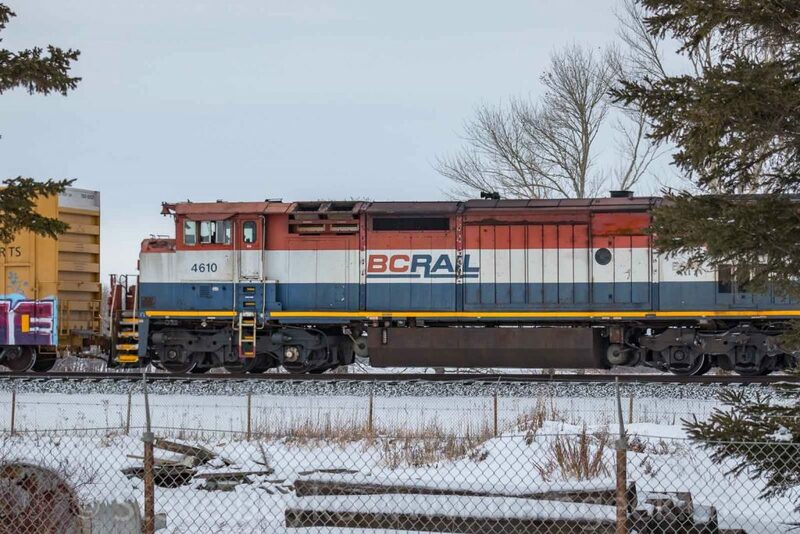 This train had no buffer cars – not required in Canada – and had ex CSX unit GECX 7342 as the second locomotive. It says “CW40-8” on the side under the numbers. The third train was just west of mile 20, with lone unit IC 2711 at the point. 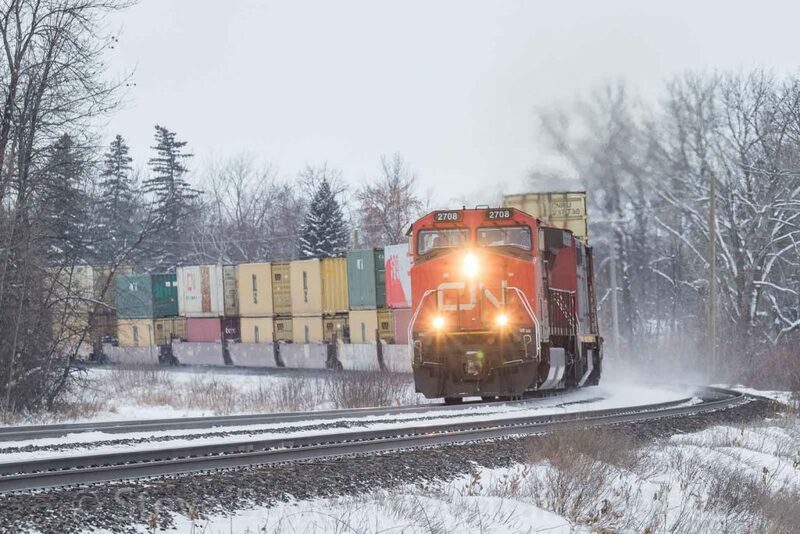 A CN freight train with IC 2711 leading. I left the tracks and drove north to the Trans-Canada Highway to continue west. I passed Elie with no sign of trains. As I approached Fortier (between Elie and Oakville), I spotted a train coming out of Oakville. I looked for a place to get back to the tracks for a closer look. In the prairies, there are cross roads every mile, so it’s not hard to find a road that meets the tracks. In retrospect, I should have gone one more road west to get closer to a bend in the tracks. I stopped and fiddled a bit with my tripod, losing time. I abandoned the idea of video and just took stills as the train rolled by, casting a cloud of loose snow in its wake. The train had CN 2259 leading, with leaser GECX 7365 behind it. I did enjoy this BC Rail flatcar full of wheels. After the train passed, I continued on to Oakville. There were no trains in sight, so I carried on west along provincial road 331 through Newton to “road 31W”. This area is called “Curtis” on Google Maps, but if you head north on 31W you reach what CN calls Nattress. As I drove north on 31W I saw a train was rolling east. I knew I wasn’t going to get to the tracks before the head end passed, and the road was snow covered as you can see in the blurry photo above. I drove as far as I felt I could, then pulled over and jumped out to snap that long distance photo using my telephoto lens. It was CN 2263 East. I saw the portal from that area, and took the lead photo of this blog post. Here’s a CSI-enhanced version. I believe that’s a reflection of the lights in the portal visible in the “mouth” at right. The eastbound train had a distributed braking boxcar on the rear. 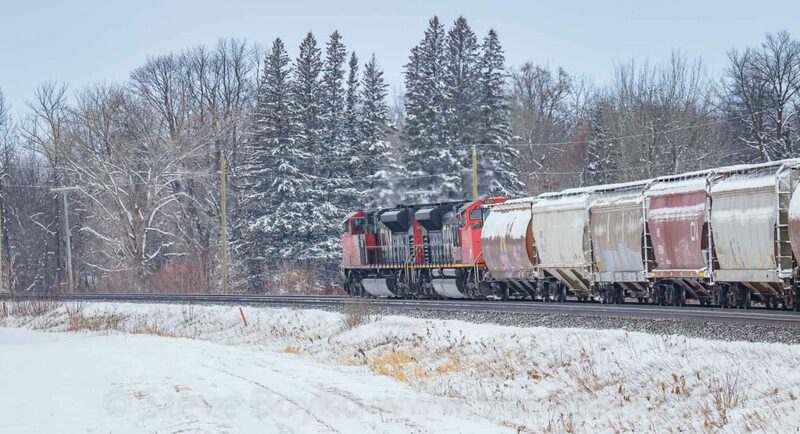 These are a common sight on CN trains in the winter. 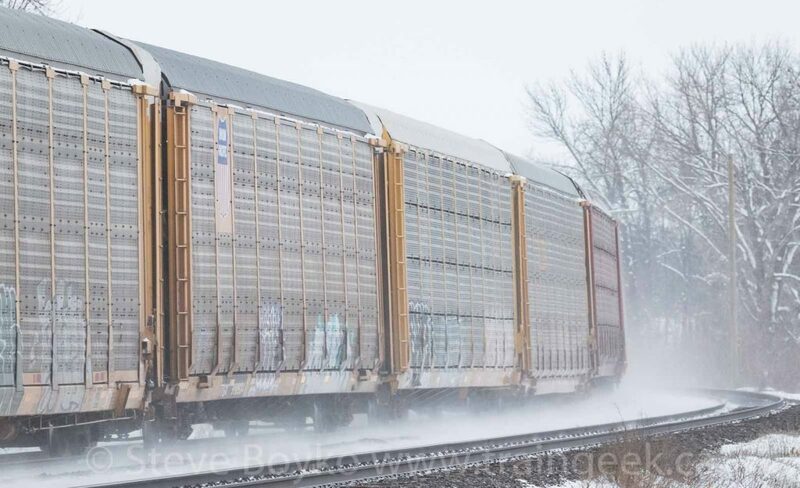 They have an air compressor in them to help maintain air pressure in the cold, and are now equipped with enough electronics that they behave like a distributed locomotive (DPU) for purposes of braking. There’s a signaled crossing (with gates) on road 31W. I parked a bit south of that and walked up to the crossing. I noted a nice bend in the tracks to the west. Soon I heard a train to the west. I set up the video camera (Canon T1i) on a tripod and waited for the train to arrive. It was led by IC 2708 and CN 2452. It looked really nice coming around that bend! Since it was overcast, it didn’t matter what side of the track I was on, so I was able to take numerous photos of the train coming around the bend. 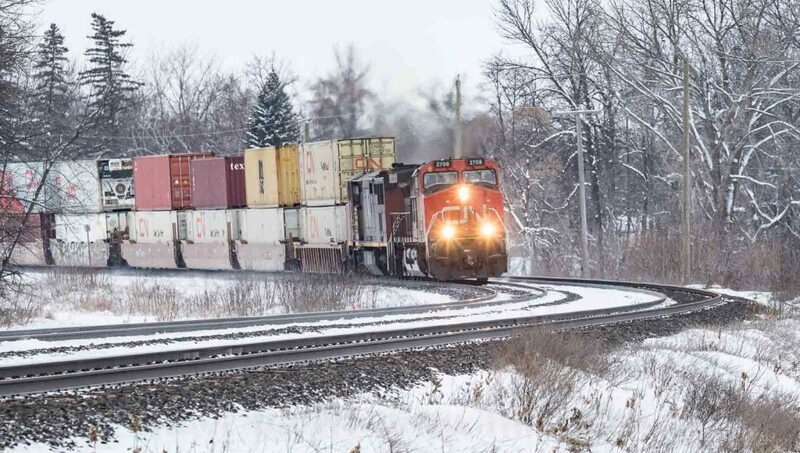 It was a solid train of containers, except for the autoracks on the rear. Only a few minutes later, I heard a train coming from the east. It was CN 3077 and CN 2036 leading a westbound general freight train. This train also had a distributed braking boxcar, CN 0041. This one was in the middle. The train disappeared around the curve, but there was another train following fairly close behind it. 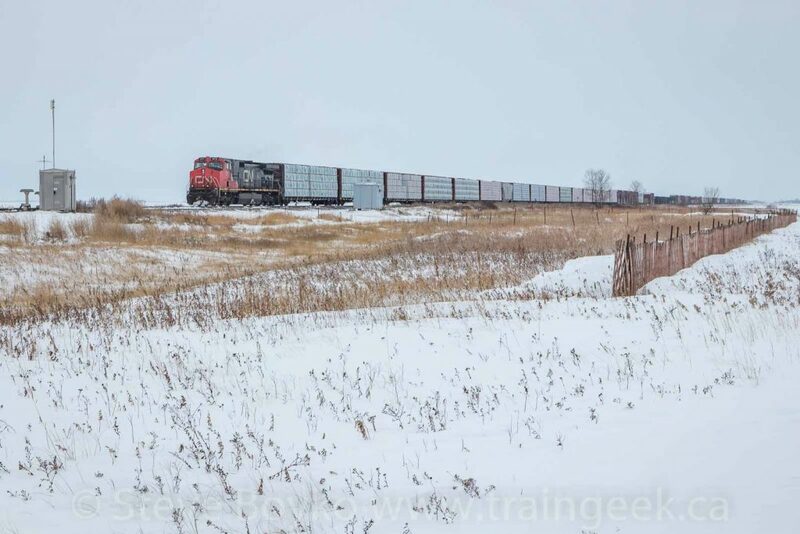 It was another westbound general freight train, led by a pair of brutish SD70M-2 locomotives – CN 8839 and 8829. I heard another train to the west, but I checked my watch and I was running out of time. I packed everything up in the car. I was a little chilled after standing outside for so long, but I had bundled up pretty well. I had proper winter snow boots and thick socks and jeans on my lower half. I wore a T-shirt and hoodie and parka so my core was warm. I had a toque on my head and heavy winter mitts with Little Hotties hand warmers, so my ears and hands were warm. The one part that wasn’t well covered was my face. When I sat down in the car, I noticed that my nose was pretty pale and numb. That’s not a good thing. I held a hand warmer on my nose for a couple of minutes, and then it turned red – a good sign. I’ve since purchased a balaclava and I will wear that outside on cold days like this to prevent that from happening again. I might look like I’m robbing a bank, but at least I’ll be warm! As I drove east along highway 331 toward Newton, I saw the crossing lights come on at the highway crossing. 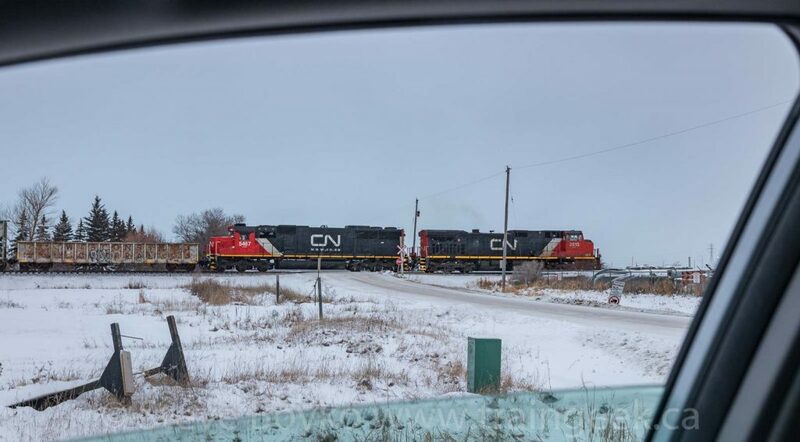 I pulled off to the shoulder and photographed CN 2600 West rolling by. 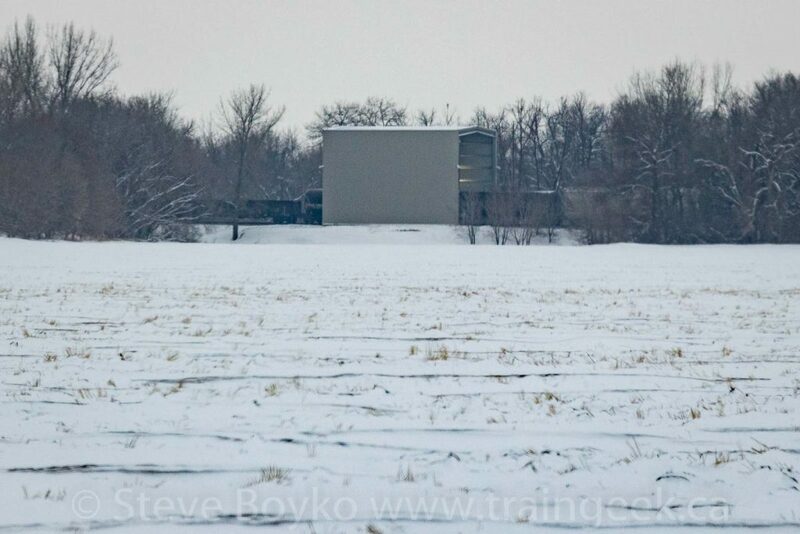 In the background of one of my photos, I believe I see a small grain elevator at the Elm River Hutterite colony. I never knew that was there… I’ll have to try to get another look some day. A grain elevator – maybe? That was five trains in 60 minutes – two eastbounds followed by three westbounds. CN is busy! 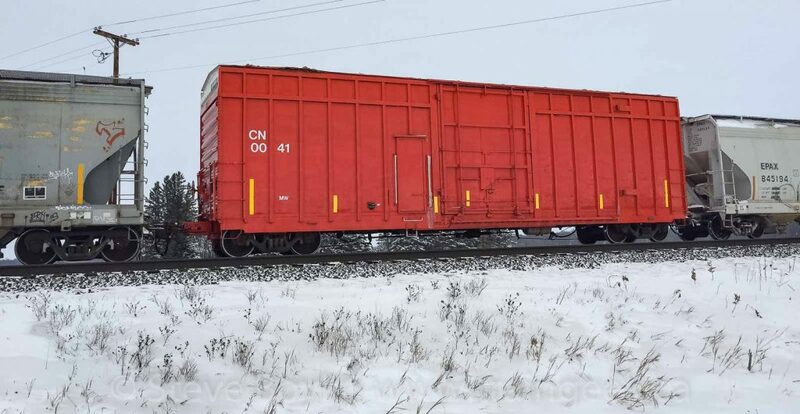 As I approached Winnipeg, I saw a familiar distributed braking boxcar – CN 0035. 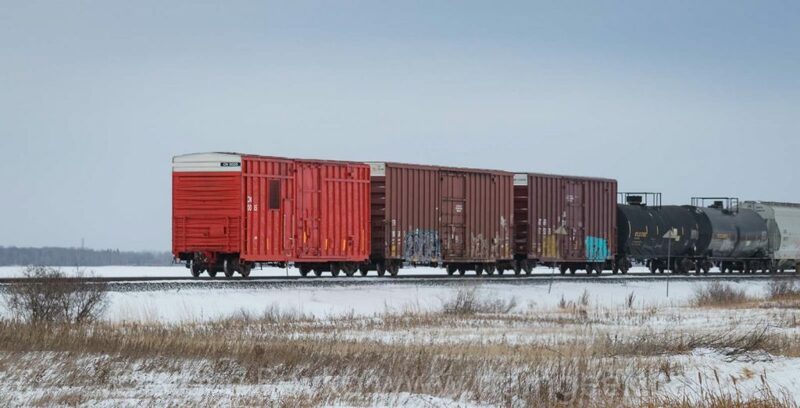 The first train that I saw at Nattress was stopped just west of Winnipeg, in one of the “parking spots”. The head end was by Hall Road, with red-white-and-blue BCOL 4610 trailing CN 2263. There was an interesting load on the train – some very long poles overhanging a flatcar, with a spacer flatcar on each side. I was able to photograph the portal, so I’m calling it a win. Mission accomplished! Send the troops home! But seriously, it was a good outing. I saw nine trains in just over three hours, so the quantity was good, and I now know Nattress is a good location for photographing trains! If you have a moment, could you please fill out this three-question survey about ads on my site? I would appreciate it very much. Thanks! Several days after I visited Nattress, there was a collision between two trains at mile 50.2. An eastbound and westbound train collided, and two locomotives from the eastbound derailed, along with eight freight cars from the westbound train. One conductor suffered minor injuries, but fortunately nothing more serious occurred. The location was about 0.5 miles west of the crossing I was at. You know you are dedicated when cold temperatures do not stop you. I also like the train coming around the curve. Happy New Year Steve!! Thanks, Jenn – happy new year! Just don’t mention to your wife that you were out railfanning with Little Hotties to keep you hands warm. That just sounds weird. Glad you survived, got some awesome photos and were not apprehended by Security or Ol’ Man Winter! Thanks for taking us along on the trip, Steve. That does sound weird but I don’t think my wife would worry! Ol’ Man Winter is taking a nap these days, it was melting yesterday. Strange weather these days. I too like the curve pics! I am so jealous at the number of trains you see! Trains up here on the Owen Sound CP line have been gone for over 20 years! My memories of trains are of previous generations of power and rolling stock. It is good to see what is rolling these days. My layout is of course mired in the 50’s and 60’s! Hi Jim, I feel for you. I lived in Fredericton NB for 25 years, and there were no trains there for at least half that time. Are there any photos of your layout online? Nice pictures Steve. I really liked the video! If you go back to road 31w, when it’s warmer, you may want to walk a short distance west around the curve and get some pics of the single track bridge across the Assiniboine! Hi Sheldon, thanks! I’d like to see that bridge but I want to be careful not to trespass. I’ll have to do some exploring when it is a bit warmer.